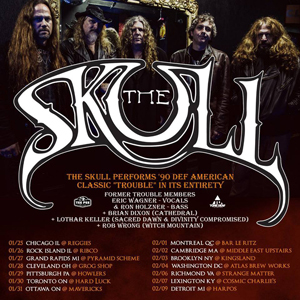 THE SKULL, featuring vocalist Eric Wagner and bassist Ron Holzner, formerly of metal legends TROUBLE, has announced a winter North American headlining tour. The 15 city jaunt, which will see THE SKULL performing TROUBLE's classic 1990 Def American Recordings self-titled debut, Trouble, in its entirety, will kick off on January 25 in Chicago, IL. The band, which also features longtime CATHEDRAL drummer Brian Dixon, guitarist Lothar Keller (SACRED DAWN), and guitarist Rob Wrong (WITCH MOUNTAIN) will also play THE SKULL songs at the special one-time-only shows. In additional news, THE SKULL has completed work on its as-yet-untitled new album. Recorded in Chicago's Decade Music Studios with engineer Sanford Parker (YOB, SECRETS OF THE MOON), the record is the follow-up to THE SKULL's heralded debut, For Those Which Are Asleep, which landed at or near the top of a host of 2014 year-end best of lists. A summer 2018 release date is projected for the new LP.